Due to consistently good efforts, Edenbridge from Austria managed to establish themselves in the world of symphonic power metal over the years. Despite their having a female vocalist, no one dares to compare them with Nightwish, and for a reason. The band has been working busily since its inception, with Solitaire being already their seventh studio record. Furthermore there have been two live albums and a best-of compilation. 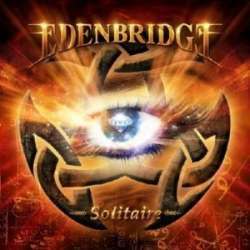 On their new CD, Edenbridge hardly take any risks and prefer to trust their reliable recipes. This doesn’t have to necessarily be bad, because combining hard riffs with melodic choruses still sounds good, at least most of the time. Like on its predecessor MyEarthDream, we find again some faster tracks, epic moments, ballads and mid-tempo parts. Most songs are between five and seven minutes long, but they took care that their single Higher, a truly catchy hit, doesn’t cross the four minute border. But you’ll find some further commercial elements, as on Come Undone which sounds also very pop. Those who prefer Edenbridge’s quieter material are served with the dreamy Bon Voyage Vagabond. It’s striking that four songs come with French titles, although the lyrics are all without exception in English. Weak points are the intro and outro which make up already more than four minutes playing time, and the nearly seven minute long Brothers On Diamir which eventually sounds somewhat unspectacular. Solitaire is definitely not a weak album. I can imagine that those only discovering Edenbridge now will be more fascinated by it than I have been. Compared to their current release, previous records like Shine, The Grand Design and especially MyEarthDream were somewhat more exciting.